A trip to Cooperstown would not be complete without planning some time to explore the breweries, wineries, and distilleries in the region with a day on the Cooperstown Beverage Trail. The 37-mile Cooperstown Beverage Trail was established after a resurgence in specialty beverage production in and around Cooperstown. The participating establishments showcase the wide array of craft beers, wines, and spirits they make paired with tasting opportunities and facility tours. Here are a few of our favorite stops on the tour plus some tips to ensure a fun outing for everyone hitting the trail. We’ll drink to that! Brewery Ommegang prides itself on their imaginative craft beers and seasonal ales including a specialty line inspired by the medieval fantasy, Game of Thrones. Located on a 136-acre farm, Ommegang offers daily tours and tastings, has a cafe on site, and host numerous events throughout the year. Using locally grown grapes and utilizing small-batch practices are key to producing creative and distinctive wines at Pail Shop Vineyards. 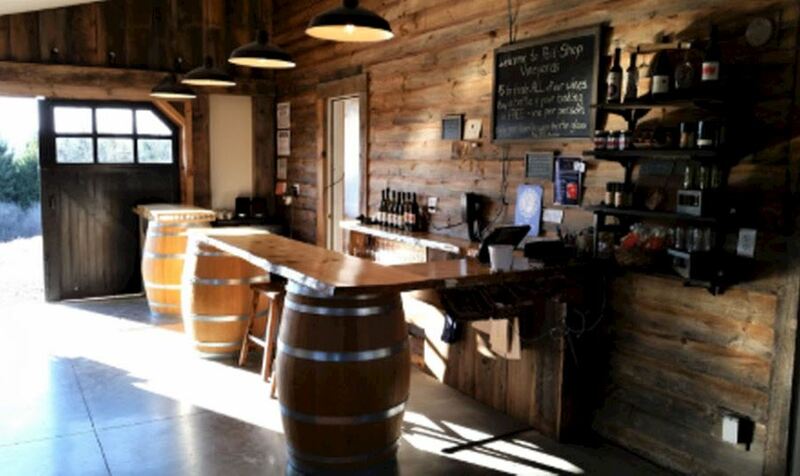 The hillside vineyard features a rustic tasting room and shop where visitors can sample snacks and chocolates in addition to wine. The outdoor seating area and vineyard welcome guests to relax and enjoy the view while sipping one of their delicious wines. Cooperstown Distillery is the regions first and only distillery to-date. Their handcrafted spirits are a nod to both historical and cultural influences in the area. The distillery produces a number of high-quality liquors including vodka, whiskey, bourbon, and rum with names such as Glimmerglass Vodka and Doubleday Baseball Bourbon. Tours and tastings are available daily. Apple wines and hard ciders, made from New York state-grown apples, are produced at Fly Creek Cider Mill located along the namesake creek just four miles from downtown Cooperstown. Two ciders and six varieties of wine round out their regular offerings with seasonal selections available on occasion. Fly Creek Cider Mill is open daily for tastings and samples of other mill-made specialties. Plan ahead of time who will be the designated driver and make sure to bring non-alcoholic drinks along so they don’t feel left out on the fun. 2. Don’t try to do it all in one day. The Cooperstown Beverage Trail covers 37 miles and roughly a dozen establishments. Pick a couple of stops so you can truly enjoy each one without feeling like you need to rush off to the next destination. You can always plan another excursion on a different day! 3. Pack water and snacks. Make sure you have plenty of water on hand to stay hydrated between tastings and have some snacks on standby too. 4. Plan your lunch break ahead of time. Pick a restaurant that will please everyone. The Hawkeye Bar and Grill has an extensive menu of local favorites and seasonal specialties as well as craft beers, cocktails, and wine if you care to imbibe. Dine inside or on the patio overlooking the lake. 5. Determine your itinerary in advance. Create an itinerary so your tour is efficient for the time that you have. Also, be sure to note the hours of operation for each establishment and check their websites or call ahead to inquire about closures, group tastings or limited tasting hours due to special events. Depending on how much time you have, you might also consider visiting any of the many wonderful attractions in Cooperstown. For a complete list of Cooperstown Beverage Trail participants or a map to help you plan your tour this summer, visit their website. We hope to see you out on the trail!